Want to keep your shrubs and trees healthy and strong? Want them to stay beautiful for years and years? Get them pruned on a regular basis! Contact our lawn care experts today to schedule your tree pruning. Pruning is the practice of precisely cutting key parts of a tree or plant, like the branches, buds, and roots. This practice not only improves health, but it also keeps trees looking great. Proper pruning is a mix of science and art, and when done incorrectly, it can cause serious harm to the tree. This is why it is important to hire an arborist or lawn care professionals to handle your pruning. They can leverage their tree and plant expertise and landscaping knowledge to improve health, while also making sure your shrubs or trees complement your surrounding landscape. At Royal Estates Lawn & Landscape, we take pride in our work and in helping the people of Louisiana create and maintain some truly beautiful lawns, gardens, and landscaping. This passion, along with years of experience, is what guides our pruning services. Regardless of the complexity or type of pruning you need—thinning, raising, or reduction—our lawn care professionals have you covered. We’ve got the know-how, the equipment, and the commitment to make your lawn stand out. In addition to handling all of your pruning, we can also serve as your go-to landscapers and full-service lawn care company, providing mulching, lawn mowing, seasonal maintenance, bush hogging, and much more! 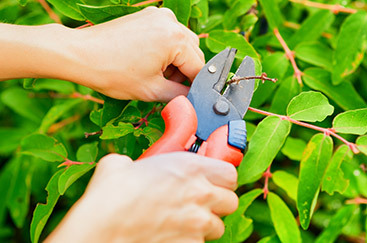 Have questions about our pruning services? Ready to schedule an appointment? Drop Us a Line or give us a call at 225-217-6792.